It is a no brainer that Google has become one of the biggest powerhouses for delivering advertising content online. When it comes to monetization, AdSense has become the most popular advertising network relatively used by most bloggers and online publishers. This is probably because of the fact that AdSense might be the simplest monetization method that currently exists. All you really need to do is sign-up for an account and set up a few ads. Publishers who have been in the game for some time now may have already observed that AdSense has plenty of limitations. However, Google has another advertising platform that plenty of website owners and bloggers have not yet been accustomed to. For those publishers and content creators who want to spice things up and add an extra kick to their ad revenues, this is where DoubleClick for Publishers comes in play. First thing that we should consider is that DoubleClick for Publishers is an ad server while AdSense on the other hand is an ad network. DFP doesn’t have it’s own ads. As a publisher, it provides you with an infrastructure where you can serve ads based from the optimizations you have set-up. AdSense works by helping you in finding advertisers who are interested in showing their ads on your website. The comparison is too distinct, kind of like comparing apples and peaches. DFP or DoubleClick for Publishers is basically an ad management tool that allows you to manage, schedule, deliver and sell your ad inventory. 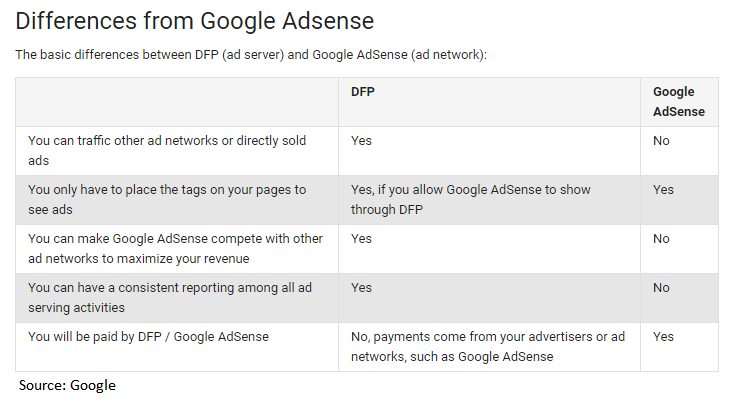 DFP gives you better control of your entire ad inventory, grants you the capabilities for better ad management, and grants you way better delivery options compared to AdSense. Sounds interesting enough right? But how does DFP work? Well first things first. You need to determine how much ad space you have and create ad units. These are spaces in your content where all of the ads will be showing. DFP provides it’s users with a complete tool-kit which was designed to make user experience better. These features help make creating and managing your ad campaigns easier. It also provides advanced reports and impressions forecasting. Here are the key features for DFP. DFP lets you calculate the estimated number of impressions that you are going to get from each ad that you are selling to the advertisers. DFP provides you a central space where you can monitor your traffic from all the platforms you are working on. These includes your ad networks, apps, games, and sites. DFP was designed so the users can obtain the most ad revenues it can get from each ad impression. It allows Ad Exchange and AdSense to scan and compete with other networks and identify where you can get maximum revenues from every ad impression. Aside from the amazing key features, DFP has been praised for having a simple interface with rich features. Oh yeah, I forgot to mention that it is free for the first 90M ad impressions! Publishers and content creators who have been in the game for quite some time now know that these days relying on AdSense and on ad networks is not enough. If you want to increase your revenues by multiple folds then implementing DFP is definitely the next big step you should take. Combined with a well planned programmatic strategy you are ensured a boost in your total ad revenues. You will have your revenues skyrocketing in no time. There is one extra thing you should know though, DFP implementation is delicate and complex. If you mess up with the optimization and set-up you might end up decreasing your revenues rather than boosting it. As publishers, remember that ad revenues are your main source of income. It is important to get the optimization right the first time! The initial set-up and optimization for DFP plays an imporant role in getting the maximum ad revenues you can potentially get. Avail Professional DFP implementation from the Monetization Pros! Let us set-up DFP for you and feel the difference when the Pros do it ! Get a DFP Quotation Now! So, what does MP consider higher payout these days? Just curious.